A new species of dinosaur has been identified. It is being called Pegomastax africanus. The dinosaur roamed our planet around 200 million years ago. It was two-legged and small in size (about 2 feet or 0.6 meters long). 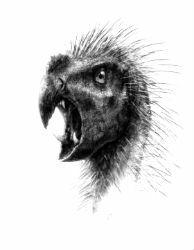 The dinosaur had fangs, a parrot-shaped beak, and was covered in bristles. It was a vegetarian. This dinosaur’s fossils were found in South Africa in the 1960s. What was happening on Earth when this dinosaur was walking around the planet? The super-continent Pangaea had started to separate into two landmasses. Here is a video showing the construction of a model of this dinosaur. October 1 is “World Vegetarian Day”. It is celebrated every year and is a day to appreciate the benefits of a vegetarian diet.